Henry Moret, Le chemin rose, 1894 | Stoppenbach & Delestre Ltd. Between 1892 and 1895 Henry Moret is considered a pillar of Pont Aven school. Paul Gauguin has left for Tahiti and his artist friends find the freedom and audacity to paint in their individual style. Moret evolves towards Synthetism. 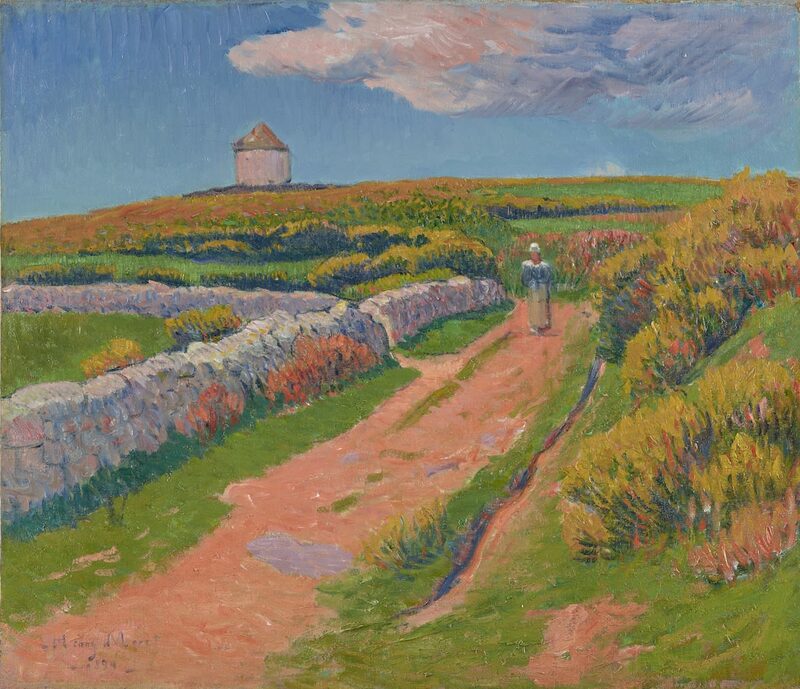 Le chemin rose painted without doubt during an excursion to the islands of Groix, Houat, Belle ile or Ouessant possesses all the proper colours of Moret’s palette. The powerful pink and the forward plains very worked and the pink path bordered by geneys of deep yellow bring one to the very low horizon punctuated by the presence of the peasant woman and the mill on the left hand side. Moret knows how to render the depth of this path which goes nowhere and is lost in the horizon. This painting exhibited in the United States with the title “Payasage a Pont Aven” is clearly one of the last works totally synthetic before Paul Durand Ruel began to buy the artist works from December 1895. To be included in the forthcoming Catalogue Raisonné being prepared by Jean-Yves Rolland.